A sheriff's office in Florida has released frantic 911 calls from bystanders reporting an alligator attack at a retirement community that nearly killed an 85-year-old man earlier this week. George Ihle Jr was bitten on his foot by the nearly 10-foot-long reptile at the Big Cypress Golf and Country Club in Lakeland on Monday. Ihle's wife heard the man's screams and found him on the ground bleeding from a wound on his right foot. Another witness called in telling the disaptcher: 'There's a gator eating a man,' reported ABC News. 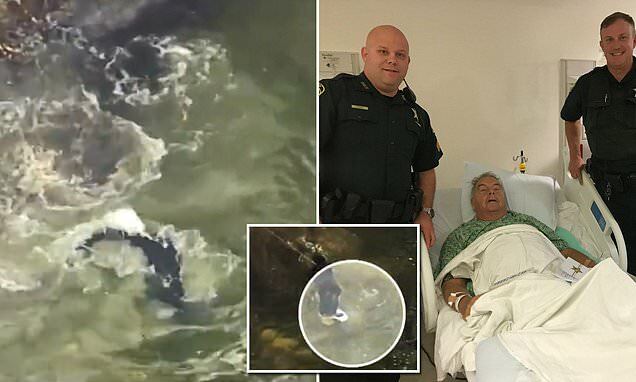 Polk County Sheriff’s Office spokesman Brian Bruchey said the gator pounced on the retired US Marine living with his wife at the Cypress Lakes Retirement Community at 10000 US Highway 98 North in Lakeland Monday afternoon. According to a post on the retirement community's website, Ihle was attacked by the alligator while chasing birds off his property.